I wear the team shirt for Luís! ¡Me pongo la camiseta por Luís! Supporters of Justice for Luis Góngora Pat told us they want to wear their heart-and the memory of Luis-on their sleeve! We heard you! Here is the way to get a tee! 24 purchases will get the tees to the printer. All funds raised will go to Adriana Camarena, the organizer for Justice & Honor for Luís Góngora Pat, killed by SFPD April 7, 2016. Friday April 7th, 2017 is the One Year Anniversary of the death of Luis Góngora Pat at the hands of the SFPD. 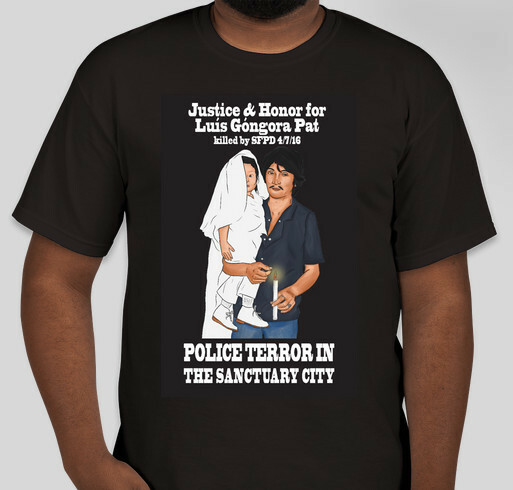 The Justice & Honor for Luis Góngora Pat Coalition is launching this t-shirt campaign in advance of his anniversary because supporters say they want to wear their heart -and Luís- on their sleeve! In Spanish, we say "me pongo la camiseta" or "I wear the team jersey" to mean that we are one with a cause. Luis loved team sports and we are a team rallying around a cause, so we invite you to join team Justice & Honor for Luís Góngora Pat by purchasing a t-shirt. This campaign will raise a tiny amount ($100 says the booster calculator) because we are choosing to price at minimum amount. With this campaign we just want our team players to wear the team shirt (and get the exact size they want)! ¡Ponganse la camiseta! If you don't want a t-shirt but do want to donate, please go to our Luis Góngora Pat Anniversary Memorial Fundraiser here. But what about funds raised? Who was Luis Góngora Pat? Luis was a 45 year old indigenous Mayan Mexican, an immigrant worker and a family man who for a decade and a half supported his wife and three children in the small town of Teabo by sending remittances from his dishwasher and line cook earnings. In 2014, he and his brother Jose were illegally evicted from their home in the Mission District during the peak housing crisis of San Francisco, after which they became homeless. Extended family helped his brother get back on his feet, and the plan was to help Luis next. But his life was brutally cut short; he became a victim of police terror in the Sanctuary City of San Francisco. To learn more about our Coalition efforts to demand justice for Luis' killing and honor his memory, please visit www.justice4luis.org Thank you! ¡Gracias! Share Why You Support "I wear the team shirt for Luís! ¡Me pongo la camiseta por Luís!"